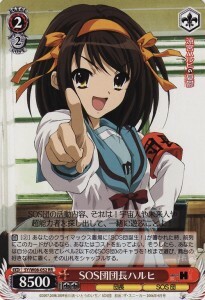 The European Grand Prix (EGP) is a project brought by Epitanime, and based on a European circuit for a japanese TCG (Trading Card Game), Weiß Schwarz. The game is edited by Bushiroad, and is inspired by the most famous animes and video games from Japan. 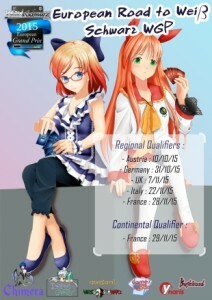 Next to Weiß Schwarz english circuit, the EGP is composed of a succession of qualifying stages in Germany, Austria, England, Italy and France, using the japanese version of the game. Epitanime will host both the final stage and the big finals, where the players who qualified all around Europe will gather ! The winner will be automatically qualified for the World Finals in Japan. Sponsored by Bushiroad, this event is organized by Epitanime and will bring to the players special prizes from the editor, as well as a trip to Japan for the one who will emerge as the champion ! Well known as THE place to be among the Weiß Schwarz european community, both the french qualifier and the european championship are free, and our own way to enter the japanese competitive scene ! See you on the 28th and 29th November to try your luck with us ! To pre-register, click here !